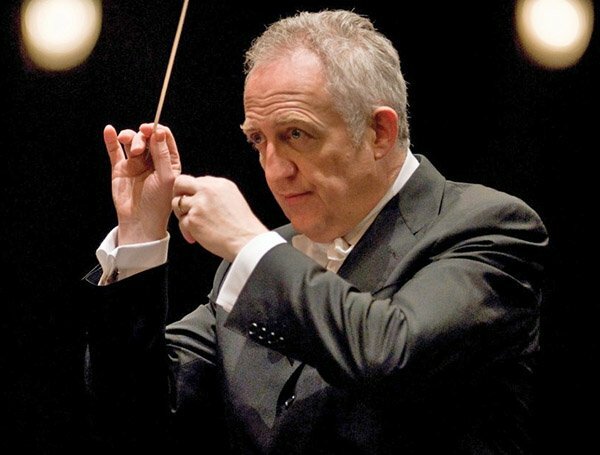 The distinguished British conductor/composer Bramwell Tovey became Boston University Director of Orchestral Activities in September, several months after the retirement of David Hoose, who led the program from 1987 to 2015. Readers can evaluate the wisdom of the appointment on November 13th at 8:00 at Symphony Hall, when Tovey leads the BU Symphony Orchestra in Lili Boulanger’s D’un matin de printemps, Igor Stravinsky’s Pulcinella Suite and Le Sacre du printemps. More HERE. Realted review HERE. BMInt’s discussion with him follows the break. FLE: You’re not exactly a neophyte in Boston, you’ve conducted the BSO three or four times and Tanglewood three or four times, haven’t you? Are you going to spend much time here? Wait, wait, you didn’t apply. You were tapped. I wasn’t tapped by the university. I was tapped by a couple of musicians in the Boston Symphony who teach at the university who said to me, you know, this would be really right up your street. After being a music director of a North American orchestra for 30 years I just wanted to have a change of rhythm in my life. So far I’ve enjoyed every moment. The students are super bright and very dedicated to pursuing excellence. So what does it mean to be director of orchestra activities? It sounds like I’m responsible for their social scene, doesn’t it? I plan the concert programs, most of which I’ve chosen this year. I select the guest conductors. I’m assisted by the associate director, Neal Hampton, who is a terrific musician and wonderful colleague. I’m also responsible for the orchestral conducting curriculum for master’s and doctoral students. We don’t have any master’s students this year but I have two very gifted doctoral students; I’m quite sure both will enjoy excellent professional careers, so that’s a big responsibility in itself. And also, as David Martin, who’s head of the wind ensemble here, said to me at lunch today, I need to get used to the whole scene—he called it “a transitional year.” I’m finding out how an institution like this can use somebody like me, who comes from a performance background. For 40 years I’ve been conducting opera and concerts all over the place, but I’ve never taught, except for the odd masterclass and residential course. Nonetheless, I have had assistants whom I’ve coached, and that’s the angle from which I’m approaching the task. Well, to teach conducting is basically one on one, isn’t it? It has to be, a kind of bespoke instruction method for each individual. There are some times where I can hold seminars with both students. Funnily enough, I’m getting together with both of them for the first time, straight after this interview, but hitherto I’ve only met with them individually. It’s a great responsibility to be presented with two young careers with tremendous potential. My duty is to give them as much individual guidance as possible. Conducting can be a very lonely occupation. Imagine a graphic where a conductor’s skill occupies circle, like a pie chart. Some people have bigger indefinable aesthetic attributes, others greater leadership, some might be better at speaking, others better at new music, and so on and so forth. My job is to make sure that every circle is full of the best blend of skills for each individual in order that they can go out into the world and pursue a career. Because they’re not going to be uniformly developed. No, they won’t be. I don’t think they want to be uniformly developed. I think that would be boring. Because you want to have a personality and a schtick. The stick is only part of the schtick. Well, music is a very sophisticated language. It speaks directly to the inner narrative of each listener. It’s the only language common to everyone in our diverse society. The last thing we want to do is clone performers. When I was a student, there was a feeling that conductors had to act in a uniform kind of way—I remember one conductor when I was first starting out, who though much taller than Karajan, wore the same style shirts and tried to mimic his idol. This didn’t go unnoticed by orchestral players whose crushing wit soon deflated the faux maestro. Although the conductors who would claim they did so rarely actually observed that restriction. Stravinsky said, play without expression, yet he expressed in his own recordings. You can observe him conducting on film with lots of personality and individual expression. In this pluralistic age, audiences enjoy and appreciate the varied personalities of performers and conductors—and also the many different types of music on offer. Well, by that, do you mean that there should be a cult around the conductor? Oh, no. I think cults are very dangerous and ridiculous. There have been far too many messiah complexes and way too many patriarchal structures. The modern conductor is a primus inter pares figure, who directs proceedings, and empowers the musicians. Certainly a good conductor drives the interpretation, shapes the reading and leads the room. The best conductors adapt to every ensemble—and still manage to imprint their musical personality. When I’m with the New York Phil or BSO, I’m a different conductor than when I’m building a performance with the BU students. Here, I do a lot of essential forensic work, tuning the orchestra, fixing the ensemble, teaching the notes, talking about phrasing inflections, the style of each composer. If I used that kind of technique in front of the BSO or the New York Phil, they’d be very polite but I’m sure their eyes would gently glaze over. With a major orchestra they much prefer a conductor to lead through musicianship and gesture than through constantly stopping proceedings to talk—most problems in a great orchestra get fixed after the initial run through – that’s when the fun begins..
Dohnányi once famously stopped the first chord in a BSO rehearsal and said, gentlemen, we have to tune. You, you’re too low. You, you’re too high. And that didn’t win friends. That was kind of show-off. I wonder if he actually could hear individuals in sections. He probably could, but so could most of the musicians too. Personally, I believe that when you start rehearsing at 10 am it’s worth remembering that players have been dropping kids off at school, or traveling on a crowded subway, or maybe filling out tax forms or doing the weekly shopping—who knows? Conductors should allow an orchestra to settle in at the beginning of a rehearsal. There are occasions when you need to dig in straightaway but today’s orchestral musicians are genuine virtuosos and conductors will enjoy greater results when it’s clearly apparent that they trust the musicians. But you know, if you sit in the front row of Symphony Hall, where you don’t have the benefit of the blend, and you do hear individual string players, they’re not all playing exactly the same note. Nor could they be expected to be. The French have a beautiful word for blend, mélange. I think mélange starts to occur in Row 10 of most auditoriums, even in Boston’s beautiful hall. Our Equal Temperament tuning system means that we are already compromised – a string player’s A sharp is different to their B flat but the notes are the same on the piano. Forging the blend of colors and pitches is part of the conductor’s responsibility but in great orchestras it’s a natural part of what’s happening all the time. Personally, I don’t like being close to the front of an auditorium. I prefer to be higher up and further back. I like to be able to see the action as well as hear it when I’m not conducting. But almost the worst place to listen to a concert is from the podium. Usually the brass is swamping over, or maybe there’s no projection on stage for the woodwind instruments. Having an assistant conductor in the hall helps proceedings, though it is the conductor’s responsibility whether a guest or a music director, to ensure the balance of the orchestra. But you do sometimes, when you’re conducting a new orchestra, step back and listen to the blend in the room, presumably. Sometimes, but that can appear a little pretentious. It isn’t always necessary. I tend to rely on the ears of the assistant, who has usually been well trained and is ready and eager to talk about balance issues and much else besides. As a guest I also rely on the players who know and understand their own hall. I can’t underline how important it is to trust musicians as a conductor. On the other hand, you might get contradictory advice so it’s essential to know your own mind. So case in point, you conducted the BU Symphony for the first time a couple of weeks ago at Tsai, which is very dry. It is not the most resonant space in Boston…. There is an artificial reverb system, but they rarely have it turned on. You should experiment with that, because I’m told that if it’s set right, it’s helpful. I believe so. I haven’t had time to do that yet. And then, in two weeks, or a few days before this prints, you will be conducting the same orchestra at Symphony Hall. So it won’t sound like the same orchestra. Well, Symphony Hall is one of the greatest acoustics in the world. It won’t sound like the same orchestra even though it’s still the same musicians, with the same tuning and blend issues. There will be different results. Many orchestral issues come down to the ability to hear one’s colleagues. Symphony Hall is renowned for being a naturally beautiful acoustic environment but there are many halls in the country—David Geffen Hall in New York, for example—where hearing one’s colleagues is very hard indeed. So how did you book the season for this orchestra without ever having heard this and knowing what raw material you would have? Well, I knew about the reputation of the BU Orchestra. I did come through and do a day’s teaching and conducting last year. That gave me a very clear idea of the standard of the orchestra. I also saw a couple of videos on You Tube. We talked at great length about the kind of pieces we felt were important for the students to tackle. We consulted the repertoire archive from the last ten years. I wanted to encourage the school to think big about its orchestras, but they were already ahead of me there. The orchestra program is at the front of the school’s thinking. We have many students, but there are ample opportunities for everybody. Dr Shiela Kibbe, ad interim Director of the School of Music asked if I could include as many students as possible and conduct both the chamber orchestra and the symphony orchestra at Symphony Hall. In order to do that, I needed a big, extravagant work for the symphony orchestra. Le Sacre du Printemps fits the bill and we’ve organized everything else from there. The orchestra has done it before although, of course, none of these students were at BU in those days. I haven’t yet had the privilege of meeting Maestro David Hoose, my predecessor, but it’s very clear he covered an enormous amount of repertoire. Strategically I would have preferred to wait three years to do the Rite of Spring, but we thought let’s just do it. Because no one will have necessarily been here for three years when you do it three years from now. Some of them will be freshmen, and some of them will be sophomores anyway. So it’s a continuously changing orchestra, probably depending on what scholarships are being offered here, and what the competition is offering. As we devote more time and energy to the orchestra program, and think about the orchestra being a key lynchpin of BU, we plan to develop the program as much as possible. BU is a wonderful destination for the very best young instrumentalists; it’s an outstanding university and of course, so many great musicians, including many of the BSO are on faculty. Do you have the sense that BU is stepping up its conservatory efforts? Yes, I do. Most definitely. When I started talking to BU about coming here, the first thing I did was turn the job down. It seemed that with everything I was doing elsewhere, I didn’t really have the time to be part of BU’s very exciting vision. Dean Lynn Allen rang me up and said most persuasively that she felt that I should revisit the decision – having a first-class orchestra at BU was front and centre of their thinking. And I could understand why because there is a lot of competition in Boston—two great maestros are already in town making music with students – Hugh Wolfe at the NEC, and Ben Zander with the BPYO. I’ve met Mr Wolfe before as he’s been a welcome guest conductor in Vancouver several times, but I haven’t yet met Mr. Zander. I was very touched when he thoughtfully phoned a couple of weeks back to welcome me to the city. All conservatories want stars in their faculties. You weren’t here years ago when Phyllis Curtin took over as dean here, and raided NEC and took some of their best talent. And there has been some sort of, some rivalry. And I had sensed that at NEC 10 or 15 years ago, there was a reluctance among would-be soloists and chamber players to take part in the orchestras, and I think one of the things that Tony Woodcock did, if I’m not mistaken, was to require every orchestral instrument player to play in an orchestra, because some of them imagined that they’d be in string quartets or soloists, and weren’t interested in the teamwork. I was well aware of NEC’s fine orchestra. I rang Tony Fogg, the Artistic Administrator of the BSO. and asked his opinion about the position at BU , especially knowing the competition in the city. Without hesitation, Tony said I should definitely take it— certainly, being with the BSO at Tanglewood this past summer was fun knowing that I was coming to BU in the fall. I also had a lot of encouragement from close friends in the BSO. Well, so do you have the sense that the students here want to be orchestra musicians? Or do you have the sense that they’re undergraduates studying something else who just happen to play well? What percentage of them do you think are intending to have careers as orchestra players? That’s a really interesting question. And I’m not sure that right now I’d be the best person to give it an accurate response. You haven’t memorized 130 names yet. No, I haven’t. Actually, I’m not even on the university computer system yet. But I did have the chance to speak to the orchestral student body outside rehearsal at a meet and greet event – it’s so important to remember that every student has their own back story, their own ambitions. Only a few of them have shared those thoughts with me so far. Some are very keen on being orchestral musicians, especially the ones that I met at the Tanglewood Fellows Orchestra last summer. Others are, as you say, majoring in something else, but really play to a very high level, and other students are very keen on performing at a high level in an orchestra, but don’t see themselves as being professional orchestral players. I think some students slide in and out of each category, depending on how challenged they feel in a particular week. All are dedicated to excellence though, and that makes the whole project so attractive. They are such impressive students and it is a great honor to be their director. Do you intend to take any tours with this orchestra? The first thing to do is to get the orchestra very well organized on stage and fully establish in its new identity. We have an excellent manager, Mary Gerbi, who organizes the orchestra superbly and a librarian as good as any I’ve ever worked with in Meredith Gangler. When we’re ready, I’d like to explore the possibility of doing run outs to maybe Worcester Mechanics Hall or Troy Savings Bank Music Hall. Once we’ve done a few runouts and have a sense of what it’s like to play a program in a different acoustic every night then maybe we can look at the possibility of touring further afield. 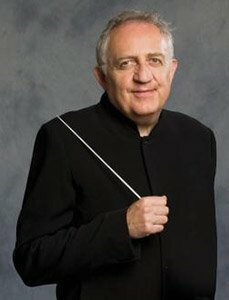 Do you have any other long-term goals for the orchestra in terms of new music versus old music? Well, any orchestra I’ve ever directed has had a big diet of new music. We didn’t do new music in our first concert because we just wanted to focus on getting launched in the first week. Jennifer Higdon and Philip Glass have been on our orchestra programs this fall and the unfamiliar is represented at Symphony Hall by Lillian Boulanger. We’ll be doing student composer reading sessions during the last few weeks of this semester which I will conduct. Embracing the creative side of our art form is very important and I’m grateful to all my colleagues on the faculty who are helping me realize the many possibilities at BU. Although your predecessor was an aficionado of new music, under one of his hats. Tony Fogg was so enthusiastic about Hoose’s fascinating repertoire choices. He felt that those programming ideas brought a great deal of focus and attention to the orchestra. I’ve only been here a few weeks but new music is most definitely part of my musical DNA. Talking about novelties, I remember David Hoose leading Grainger’s The Warriors a few years back with 2 conductors 3 pianos and an off-stage orchestra. You’ve had many years to program what you’re interested in playing. So you don’t have any pieces in your repertoire that you’ve been dying to play but have never been able to play, presumably. There are always new pieces to discover but yes, personally I don’t need to satisfy my own repertoire cravings so much any more. I’ve been a working symphony conductor for 40 years so I’ve covered most areas of standard repertoire. And anyway, this isn’t about me, it’s about the students, and it’s about their music making. Well, you can’t take yourself out of it when you’re deciding what’s best for the orchestra to play. You’re also thinking of what’s best for you to conduct in front of them. You have to have some sort of affinity for it, also. I’ll have a sort of in-built checks and balances that just say, oh, I’m not interested in that piece, or I would love to do that piece. I would say that quite often. One of my party pieces is the Enigma Variations by Edward Elgar. I conducted the BSO in Enigma in January of this year, but when Neal Hampton said he would love to do Enigma Variations for his symphony concert this month I said, great and had the pleasure of going and hearing our students from the audience. What really interests me is the satisfaction of taking the students through the process of preparation and performance. That is so deeply satisfying. To hear a student play a phrase with true excellence that perhaps eluded them at the beginning of the rehearsal process is beyond wonderful. It’s a journey of greater understanding and inspires us all. Will you have enough time, ultimately, to socialize and be part of the community? For sure. I work pretty hard and am on the road a lot, but have every intention of enjoying what Boston has to offer. I’ve attended lots of concerts already this term though I’ve not yet go to the BSO due to time constraints. What’s extraordinary to me, and I only really began to understand the extent of it when I started running the Intelligencer is how much chamber music we have in Boston. It’s astonishing. I mean, San Francisco and New York certainly have more opera, and an equal number of symphony concerts. But we must have 3,000 chamber music concerts every season. That’s amazing. I think B.U. presents around 400 concerts a year. Yeah. NEC alone claims to have 1,000 free concerts a year. So that’s a huge number already. And getting audiences in for all of them requires marketing novelty of course. It doesn’t always happen, does it? No, but some conductors say they don’t care if anyone comes. They’re doing it for the recording. Not sure about that! But certainly, with a university, it’s different, because the criteria are different. You’re not necessarily looking for a full house. The most important thing is the student experience. So when we did Romeo and Juliet, it was a mixture of Prokofiev, Delius (one of my faves) and Tchaikovsky. It was all about the orchestra hitting a new level, a new term, a new year. Everything was new. I was new. Many of the musicians were new students. It wasn’t about the number of people in the hall. But we have an innovation which professional orchestras aren’t able to embrace so easily. We have Facebook Live now, every time. Every concert we do can have parents and friends listening online around the world – my own family tuned in from Vancouver. Loved ones can now quite easily be part of every event..
Or they might come to Symphony Hall, because that’s a big deal. Are you going to be involving choruses also in any of these concerts? Oh, is that right? Oh, I can guess. It’s not [LAUGHTER]. I think I’d probably agree with you. Right now my focus is on the students who are already here, and fulfilling their needs. Sitting down and having a meet and greet on the first day of term was interesting. I was able to talk about the repertoire that I am bringing this year, including Brahms 4th, Strauss Ein Heldenleben, and Stravinsky Le Sacre du Printemps. It was great to hear what they were interested in, although you could probably take any roomful of students all over the world and they would have the same basic list of pieces. Nonetheless, it’s important to hear their views and needs directly. Now, as a Brit, I wonder whether you have any affinity for the pipe organ and the organ in the orchestra repertoire. I remember you were conducting the Cameron Carpenter concerns, and the only thing you didn’t do was cut your hair the same way as the punk star. [LAUGHTER] I’m not sure my hair would have survived that kind of a cut. But that was really festive, and you seemed to have a theatrical bent and an ease in that kind of, it’s almost crossover, that not everyone has. Terry Reilly’s At the Royal Majestic was a particular kind of piece that was quite outrageous in many respects, and just invited that extra little something. Cameron is a phenomenal musician – we also did the Barber Toccata Festiva. which is a wonderful work. And then in the second half we did Elgar’s Enigma Variations with Cameron on the Symphony Hall organ at the work’s majestic climax. If you’re doing a piece like At the Royal Majestic, frankly, if you don’t let your hair down, there’s no point in doing it. It needs that. The Elgar doesn’t certainly didn’t require theatricalities in quite the same way. The organ is ad libitum, in the Elgar? Yes, but in large halls it sounds inadequate without it. Another piece with a big organ part, Bartok’s Bluebeard’s Castle…one of the doors opens to this gigantic peal from the organ, which is, that’s a tremendous moment. That would be a fun piece to do here, at some stage. And you would have soloists who were professionals, probably. I haven’t thought thought that far ahead. But trouble with organists is, there isn’t an organ at the Tsai Center so we have to be a little cautious. We did bring in an electric organ for Enigma. But it’s not always possible to get an appropriate instrument for every piece. You seem comfortable in the pit as well as the concert stage? I cut my teeth on opera and ballet—between 1975 and 1984 virtually all my professional work was from the pit. But isn’t that what you’re supposed to do? Start off in the orchestra pit having played the piano for most of the day at rehearsals? It’s the best way to learn. Do you want to be known as a generalist? I just want to be a musician. I don’t care if I’m known or not. What I really want is just to make music, and I’m very lucky that I’m able to do so with such wonderful colleagues. And you also speak well, I remember, with the Terry Reilly, you gave a hilarious introduction. I can’t remember exactly what you said. I can never forget when Michael Tilson Thomas was giving one of his Spectrum Concerts, which began with a lecture, and 10 or 15 minutes into the lecture, one of the trustees stood up on the floor and theatrically said, “Young man, would you please shut up and play the music. [LAUGHTER] I don’t think that would happen to you, because you were entertaining and informative. Well, I think if you’re going to say something, at least be on topic, interesting, and make people smile. MTT was a pioneer at speaking to the audience so he probably came up against a good deal of resistance in the early days. So do you think you will speak in many of your concerts with this orchestra? Possibly. I spoke at the first concert and of course, we are an educational institution so sometimes there are special things that it’s fun to share with the audience. However, rule number one has to be, think of something interesting to say, then decide whether to speak or not. Don’t decide to speak and then fish around looking for stuff. That usually ends badly. A vocal teacher I know has as a motto, “think before you phonate.” [LAUGHTER] Now, apropos to phonating, you sound like you have a wonderful singing voice. How does it compare with Andris Nelson’s? At the moment I’ve got a cold so it’s a bit more resonant than usual. I don’t know Andris personally, but I believe he has a great singing voice. We’re both brass players, though. I grew up playing in the Salvation Army band. Nowadays, as far as singing is concerned, it’s usually accompanying myself in Noel Coward or Flanders and Swann and the like and then only at parties. I’ve never sung seriously. I sang in choirs growing up. And of course, I’m trained as a pianist, both classical and jazz and still play a good deal. Do you have anything more to say about how the Lili Boulanger goes with the Stravinsky? When I was looking at programming in general this year, not just at BU, but elsewhere too, I noticed Lillian Boulanger’s anniversary creeping up. She died in Paris towards the end of the Great War and was in Paris during the whole Ballet Russe era, so she was very much part of the scene in which Stravinsky created Le Sacre du Printemps. Pulcinella was written a decade later for much smaller forces after the war was over. Lillian’s death came precisely between the two Stravinsky works. The work we’re doing was written, I think, in 1916. I was actually looking originally to do it in combination with La Mer as this also Debussy’s centenary year. But for now La Mer is on the back burner. I just didn’t have enough programming opportunities this year. But I didn’t want to lose the Lillian Boulanger – she was an important figure and it’s a very beautiful piece for someone so young, even if not quite a great work. It exists in three slightly different versions. We know of her sister Nadia, a tremendous teacher and conductor who was a huge influence on so many 20th century composers and whom I once witnessed in action at the Royal Academy of Music. Lillian Boulanger has been largely ignored. Although we do have a Lili Boulanger Charitable Foundation in Boston. It’s reasonably active. Oh, wow, I had no idea. You are also active as a composer, having written commissions for the New York Philharmonic, the Toronto Symphony, the LA Phil and an opera for Calgary Opera. This month you had a chamber work premiered at London’s Wigmore Hall. How do you find the time to compose? The British composer and conductor graduated from the University of London and the Royal Academy of Music and holds honorary degrees from the universities of British Columbia, Kwantlen, Manitoba and Winnipeg. His frequent guest conducting included the New York Philharmonic, the Los Angeles Philharmonic, the Cleveland and Philadelphia Orchestras, and the Boston, Chicago, Montreal, Melbourne and Sydney Symphonies. He won the JUNO Award for Best Classical Composition in 2003 for his choral and brass work Requiem for a Charred Skull. With violinist James Ehnes, Tovey and the VSO won a GRAMMY® and a JUNO award in 2008 for their recording of Barber, Korngold and Walton concertos. In 2015, Tovey was awarded the Oscar Morawetz Award for Excellence In Music Performance and is donating the $20,000 award to the VSO School of Music bursaries to study with VSO musicians. In addition to being an accomplished conductor and composer, Tovey is a talented pianist and has appeared as a soloist with many major orchestras including, Los Angeles, Melbourne, New York, Pittsburgh, Sydney, St. Louis, Toronto, and Royal Scottish orchestras. Tovey accepted the directorship of the Vancouver Symphony Orchestra (VSO) in 2000, and for the VSO’s 100th season in 2018, he will take the title of VSO Music Director Emeritus. Having sung with TFC under Maestro Tovey, I have to say that his appointment at BU is a major coup for the institution. His love and mastery of American music in particular were exemplified in his not only conducting but playing ragtime piano in the BSO’s production of Porgy and Bess a few summers ago at Tanglewood. He is a more than worthy successor to David Hoose.